Carbon fibre chassis technology looks set to make the leap into the mainstream thanks to BMW’s dedication to the wonder-material. The Bavarian firm’s car-making arm currently leads the world in the technology needed to mass-produce structural carbon-fibre components, and having cracked the challenge of making structural carbon cheaply and quickly enough to be viable for the mainstream market, it’s spreading the material across the rest of its range and looking at using it to replace steel and aluminium frames in its motorcycles. New patents reveal two distinct carbon-fibre frame designs, complete with details of how they can be made quickly and at the lowest possible price. The advantage? Weight. Although differences in construction and characteristics mean it’s hard to make like-for-like comparison between carbon-fibre and metal components, aircraft use regularly results in components being as much as 40% lighter than their metal equivalents. Looking at BMW’s patents it’s clear that the two designs could replace the entire range of metal frames. 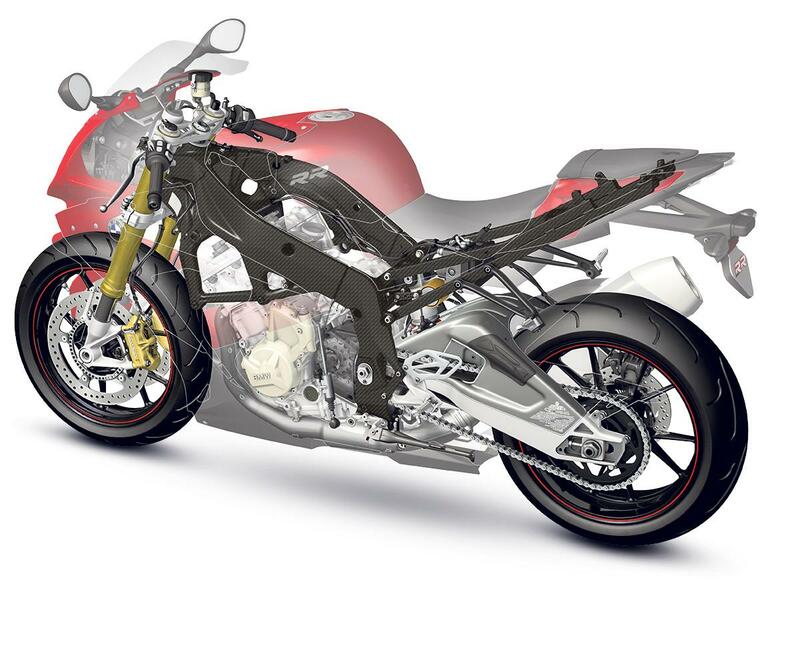 One reveals a race-style beam frame that’s clearly been created with machines such as the S1000RR superbike in mind, while the other is a clever, modular trellis design that’s intended to be easily modified to suit a wide range of bikes, and which would be ideal for the firm’s big-selling R-series boxer-engined models. While BMW’s carbon-fibre beam frame will look much like a conventional aluminium chassis – apart from its woven finish – the patents reveal that internally its construction is quite different. Its creation starts with eight lengths of ‘pultruded’ carbon-fibre. Pultrusion is a method of making long tubes or strips out of carbon-fibre, where the woven or braided fibres are pulled through a bath of resin and then a heated die which cures the resin and forms the shape of the tubing, which can then be cut to the desired length. The pultruded parts are square-section tubes that are only partially cured, so they remain malleable enough to be formed around a buck where they’re added to pre-made metal or carbon-fibre parts including a headstock and a pair of cross braces – one below the swingarm pivot, the other forming a top mount for the rear shock. The four longer pultruded sections form the main frame rails while two shorter ones run from the headstock back to where the engine’s cylinder head will be, becoming front engine mounts. Carbon-fibre sheets are then added to both the outside and inside walls of the frame, hiding the square-section tubes and creating the sort of familiar beam-frame shape we’re used to seeing, before the whole lot is baked under pressure in an autoclave to completely cure the resin and give the chassis its finished strength. BMW’s beam frame can be made relatively quickly but it’s still a little labour-intensive, so the firm has come up with a cheaper, more adaptable trellis design intended for less exotic bikes. Like the beam chassis, the pultrusion process is still key, but for the trellis it turns out simple round-section, hollow carbon-fibre tubes. These can be cut to any length to form the tubes of the trellis frame, just like a metal trellis chassis is made from lengths of steel joined together to form a frame. The difference comes where the tubes are connected. Where a steel trellis would be welded together, the carbon chassis uses cast junction blocks to clamp the tubes together. The patent explains that these could be made from metal or carbon fibre, and that by changing their geometry and dimensions there’s virtually unlimited scope for the final shape of the motorcycle’s chassis. Interestingly, the trellis design also allows for a combination of different materials to be used. Metal or even plastic tubes could be used in conjunction with carbon fibre ones, so weight, flexibility and cost can be almost infinitely controlled. What makes these designs fascinating is the fact that the firm already has facilities capable of turning out large amounts of pultruded and sheet carbon fibre and turning them into finished, showroom-ready components. BMW’s i3 electric car and i8 hybrid are both full carbon monocoques, while the new 7-Series uses a carbon fibre safety cell around the passengers. BMW are likely to make 100,000 carbon-fibre structured cars in 2016, from a total production of around 2 million. Given that carbon-framed bikes are likely to initially limited to range-topping bikes, BMW would only need to make a few thousand to start with, and that looks like a very realistic prospect.